Wondering what the new year will bring? Wonder no longer! With the 2014 Kobold Press 13-month Calendar on your wall, each month brings you a new scene of wonder, mystery and adventure: from the depths of a ghoul-haunted dungeon to distant planes where the fractal dance of Law and Chaos orders the universe. All this and more, brought to life by talented artists including Ben Wootten, Craig Spearing, Aaron Miller, and Ralph Horsley. Birthdays of famous science fiction and fantasy writers, and gaming professionals, including the birthdays of a few Paizonians, some Wizards, and the Kobold crew! 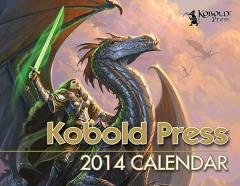 Let the 2014 Kobold Press Calendar be your companion and guide to fantastic adventure. A new year awaits—onward!